Built in 1894, the Mountain Laurel Inn on 136 Jackson Avenue in Bradford, Pennsylvania, offers old world elegance with all the amenities. Nestled within walking distance of Bradford’s National Historic District and close to all the recreation in the Allegheny National Forest and Allegany State Park, the front porch swing and white wicker rockers await your arrival. This Victorian Inn has seven rooms; each is equipped with a private bath, air-conditioning, TV, with some featuring a fireplace. 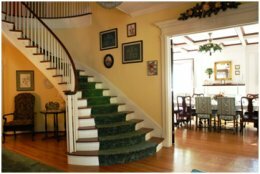 A beautiful curving staircase welcomes you on your arrival. 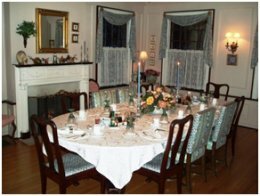 Resident innkeepers Bob and Carolyn Krebs will pamper you with a delicious home cooked breakfast in the formal dining room, complimentary beverages, and superb service. A charming, comfortable parlor invites evening relaxation. Business travelers welcome. Ask for their seasonal packages.